Magdalena Reising is a Scottish born singer, harpist and songwriter . She trained at Chichester College and has an BA hons in music from Brighton University. She has composed, sung and played on many CD releases, radio performances and live concerts. Currently she performs solo with her grand harp as well as with other ensembles including the established flute and harp duo ‘Amara ‘ and the Jazz Trio/Quartet ‘The Blue Cafe Jazz’. The solo recitals will include original works as well as well known classical and popular favourites. 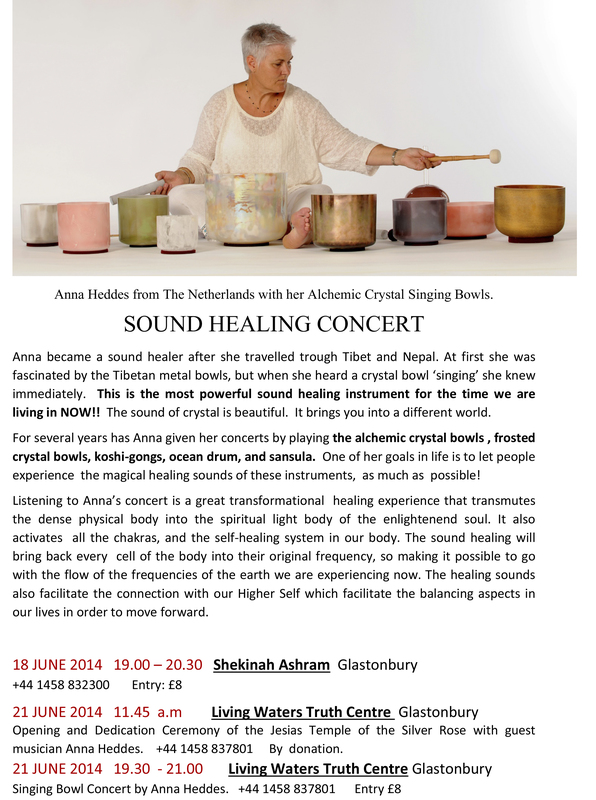 A Crystal Singing Bowl Healing Concert with Anna Heddes from Holland and her Alchemic Crystal Bowls, Ocean Drum and Koshi Gongs. Saturday, 21st. June, 2014, 11.45 a.m.
Sunday, 22nd. June, 2014, 3:00 p.m. & 7:00 p.m. The Community are invited to share in the official opening & celebration of the first European purpose built Nazarean Essene House of Prayer dedicated to our belovéd & ruling Lord, Rabboni Yeshua Ha Massiach ~ Jesus the Messiah ~ that founded the very ancient town of Glastonbury in the Beginning Times. Please wear white clothes if possible if you wish to attend. Limited parking available at the Centre. Friday, 6th. December, 2013, 3 p.m. & 7 p.m.
Magdalena Reising is a Scottish born singer, harpist and songwriter. She trained at Chichester College and has an BA Hons in Music from Brighton University. She has composed, sung and played on many CD releases, radio performances and live concerts. Currently she performs solo with her grand harp as well as with other ensembles including the established flute and harp duo ‘Amara ‘ and the Jazz Trio/Quartet ‘The Blue Cafe Jazz ‘. Todays solo recital includes original works as well as well known classical and popular festive favourites. ‘An otherworldly evening of delicate and exquisite sounds ‘ 3 Weeks Magazine.